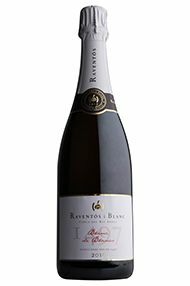 The Raventos family have a viticultural tradition dating back to 1497, making them one of the oldest continuous vineyard owners in the world. Josep Maria Raventos i Fatjo is credited with producing the first Cava in 1872, creating a legacy that the following generations take very seriously. In 1986 Josep Maria Raventos i Blanc decided to sell his share of Cordoniu, then under the ownership of the family, keeping the best vineyards for the newly created Raventos i Blanc estate (46 plots each of them with a completely distinct identity). The focus since has been on quality and regionality, in particular expressing the special properties of the terroirs around Saint Saturni d’Anoia. Chardonnay and Pinot Noir make up the lion’s share (90 percent) of this blend, but there’s room too for local heroes Poulsard and Trousseau. The grapes are farmed biodynamically, on a three-hectare plot whose westerly aspect promotes ripeness, but not at the expense of the crisp acidity key to premium fizz. Indigène’s bubbles result from a second fermentation in bottle – the Champagne or traditional method – triggered by the addition of a dash of fermenting vin de paille (sweet straw wine, rather than cultured yeast). After 13 months on the lees, it is disgorged without dosage or SO2. 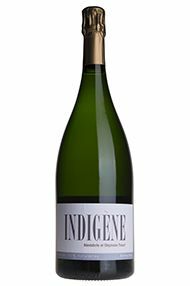 Indigène is an exceptional sparkling wine; pale gold in colour with very fine bubbles. There’s an engaging contrast between the unctuous, almost honeyed palate and bone dry finish. Try it today as an apéritif or, as winemaker Stéphane Tissot suggests, paired with creamy desserts.